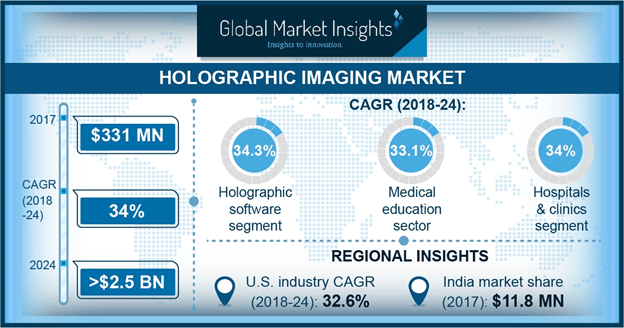 Holographic Imaging Market size is set to exceed USD 2.5 billion by 2024; according to a new research report by Global Market Insights. Rising awareness regarding availability of technologically advanced holographic imaging systems will positively influence holographic imaging industry growth. Government in developed economies such as the U.S. takes several initiatives to raise the awareness levels amongst researchers and scientists regarding availability of holographic imaging systems that facilitates the scientific research processes. However, high computational cost of processing holograms will hamper holographic imaging market growth during analysis period.